This 45 room budget hotel was opened in July 2009. 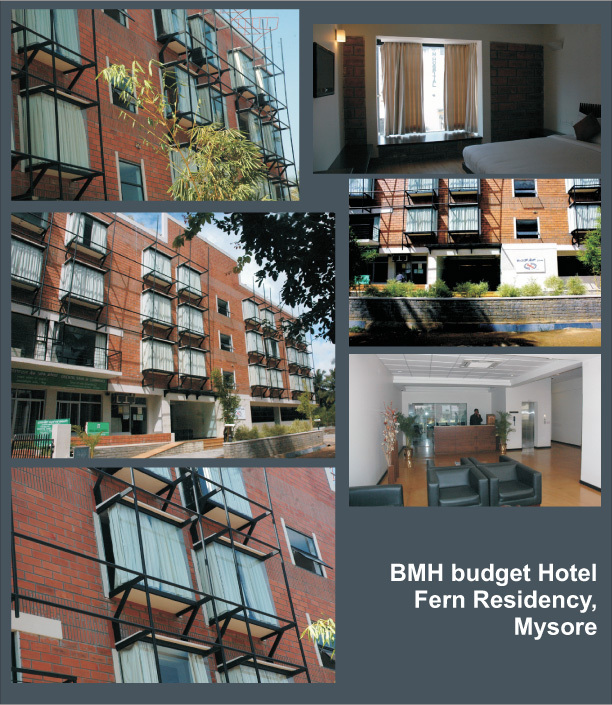 Built on a narrow site behind the BM Hospital at Jayalaxmipuram with RCC frame and hollow clay exterial walls. Each room has a bay window 6 x 6 x 2 ft coming out of the wall attatched to the wall with bolted steel frame work and precast slabs. The present trend in tourism and entertainment related architecture, is that of reducing buildings into a series of sceno-graphic episodes: images overwhelm the overall experience of the place, with the ‘space-organization’ exercise meant to be meaningful and experiential, reduced to temporary ‘set design’. The firm in an attempt to give the band wagon a miss, employs its own internal ideologies in pursuing the design of such spaces: attempting a holistic design which is not biased to the sense of vision, instead aiming to be multi-sensory. Further, spaces and details are designed to endure, and not be an ephemeral ‘vogue’. 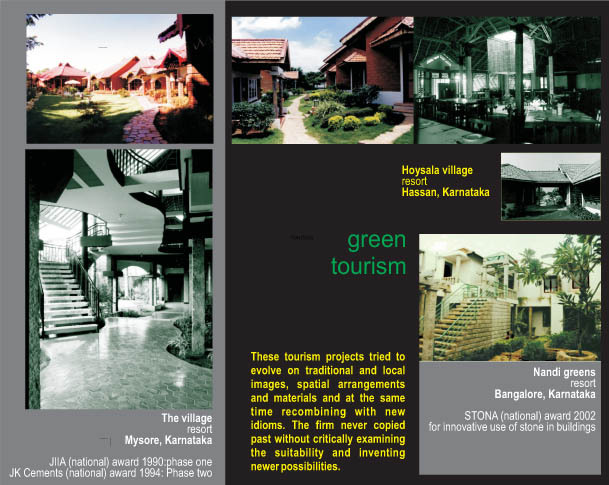 Resorts design often use both authentic and manufactured versions of ‘heritage’, for mass consumption. However, in the battle between the need for novelty and the inherent capacity of traditional images and motifs to meet it, the traditional sources are getting depleted with over use of repetitive images and facade treatments. 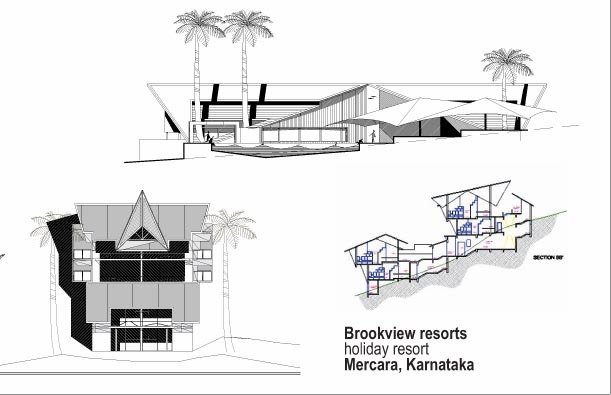 The proposed design aims to deliberately refrain from resorting to direct reference to any traditional kind of architecture, its imagery or motifs. However, the attempt will be to create a regionally relevant architecture, one that is characterized by a definite sense of place as against a feeling of a theme set. The traditional doming technique was used for brick domes, laying them in horizontal layers with a radial wire guide. The wire cut bricks used for construction provided an opportunity to expose the construction detail adding to the expression. The piped frames are visible underneath the dome revealing a playful sculptural pattern. giving a unique visual appeal with an interesting shadow pattern cast by lights on to the domed ceiling. 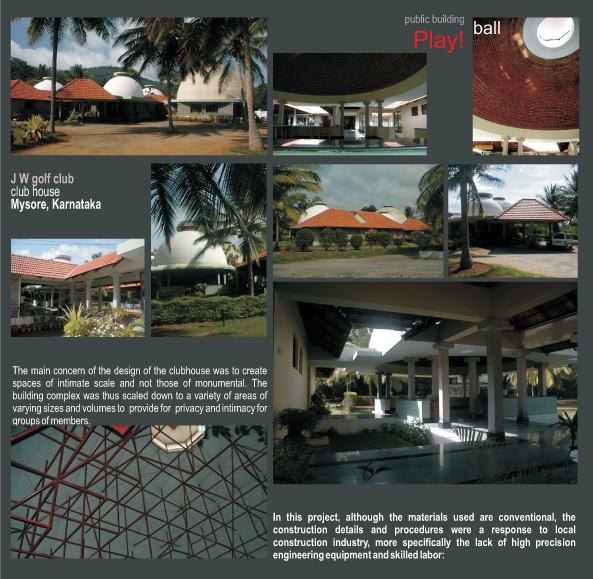 The design took symbolic cue from the golf ball. Hemispherical domes cap many public spaces interspersed with tiled walkways and lounges. This gives a combination of traditional forms suitably modified to the present and recombined playfully. The movement line meander though domed spa ces and tiled corridors with green courts. The traditional doming technique was used for brick domes, laying them in horizontal layers with a radial wire guide. The wire cut bricks used for construction provided an opportunity to expose the construction detail adding to the expression. On the whole, the building embedded low energy and made maximum use of the local climate and reduced consumption of operational energy. It used local materials and innovative recombination of traditional techniques. Thus a green architecture was achieved.